Nestled between the major thoroughfares of Crystal Lake Avenue and Woodstock Street is a two-block residential street known as Rockland Road. Up until the early 1950’s, Rockland Road didn’t exist. The land was part of a 13-acre parcel of property owned by Almon O. Rockenbach. 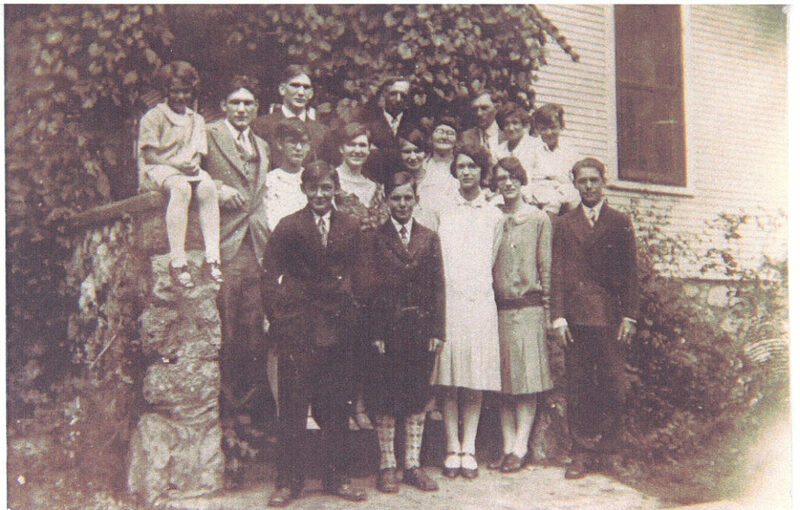 Mr. Rockenbach, his wife Elizabeth, and their fourteen (yes, 14) children moved to Crystal Lake in 1927. The Rockenbach family home still stands at the corner of Virginia Street (Route 14) and Rockland Road. According to their daughter, Sarah Rockenbach Belcher, the family’s early days in Crystal Lake were very difficult due to the Great Depression. Everyone had to work in order to help pay the bills and feed the large family. Almon started truck gardening, growing alfalfa, corn, and other vegetables to sell. He was also well-known for growing beautiful gladiolas. Elizabeth did home nursing. The children all worked odd jobs to help too. Sometimes the cupboards were bare, so the family ate huge pans of Johnny cake (cornbread) to fill their stomachs, and then canned peaches and milk for dessert. Elizabeth and her daughters canned a couple hundred quarts of peaches, pears, and green beans every summer. Sarah remembers many hobos stopping by and being fed homemade bread and fresh milk from the family cow. Soon after arriving in Crystal Lake, the family joined the First Congregational Church. The Rockenbach’s attribute their family’s survival of the Great Depression to banding together, working hard, and putting their trust in God. The Rockenbach’s lived many happy years in their family home. Elizabeth Rockenbach died in June, 1950. A few years later, Almon’s age and declining health forced the decision to sell the family homestead. Their youngest son, Phil Rockenbach, put the road in and named it Rockland Road. Water and sewer lines were also put in and the property subdivided into parcels. Phil and his wife built one of the first homes in the new subdivision.